Two Lincoln Parish School District Principals – Ruston High School’s Ricky Durrett, and Ruston Junior High School’s Daryl Savage – have been promoted to positions at the district’s central office. Durrett will become Secondary Supervisor-High School, and Savage will move into the newly created position of Technology Facilitator. The appointments are effective Friday, June 1. Promoted from Administrative Assistant to Interim Principal at Ruston High was Dan Gressett. The new Principal at Ruston Junior High will be John Young, moving from that position at I. A. Lewis. The new I. A. Lewis Interim Principal is Keshia Osborne. Numerous other personnel moves are detailed in the report that will be presented at the Lincoln Parish School Board’s regular monthly meeting set for Tuesday, June 5, 6:00 PM, Central Office, 410 South Farmerville Street. Has Rob Shadoin Ever Voted Against a Tax? HB 27 by House Republican delegation chair Lance Harris, which would have raised about $369 million in tax revenue via a one-third-cent sales tax renewal and the “cleaning” – that is, removing exemptions – from sales taxes on the books, fell short of the needed 70 votes for passage with only 64. What this vote showed, and this time, really proved beyond any credible denial, is that Edwards has no control whatsoever over his own base. It calls into question whether he even has a legislative base anymore beyond RINO Republican Rob Shadoin, who made a fool of himself by attempting to amend the bill to make it a half-cent sales tax and raise an extra $220 million in revenue. Shadoin was immediately set upon by other Republicans from the microphone, with Rep. Jay Morris asking him if he could ever remember voting against a tax increase and stumping Shadoin in the asking. Two years ago, the Louisiana Legislature and Governor Bel Edwards put in place a “temporary” one cent sales tax increase, set to expire 6/30/18. Guess where Lincoln Parish’s state representative comes down on this issue as the deadline approaches. Sixty one percent of respondents in an online survey by the Louisiana Federation of Teachers said they would support a statewide walkout or strike in order to force lawmakers to approve pay increases. The survey results were released Monday (May 21) by the teachers union. An LFT news release stated 3,832 teachers from 73 school districts in Louisiana responded to the “Louisiana Teacher Salary Satisfaction Survey,” which was provided between April 10 and May 7. Les Landon, spokesperson for the Louisiana Federation of Teachers, said Monday the survey was “promoted heavily” through social media and that it was not limited to LFT’s 20,000 union members. The survey’s findings come as teachers across several states stage walkouts over school funding. The results show that 67 percent and 76 percent of respondents are willing to petition their local school board and lawmakers in Baton Rouge, respectively, to demand pay raises. When asked “Which of these steps are you willing to take to win significant pay raises,” 59 percent said they would do a “mass demonstration” at the state Capitol in Baton Rouge. To qualify for the higher pay, a sheriff must have graduated from the FBI Acadamy, or have an associate or bachelor’s degree from an accredited institution, or have 20 years experience in law enforcement or the military. Any one of the requirements will qualify the individual. According to the fiscal note from the Legislative Auditor, the average base pay of Louisiana sheriffs today is $161,599/yr, and the average annual retirement contribution is $20,604. Former State Representative William Sumlin was in Third Judicial District Court yesterday afternoon in Ruston, but once again, a hearing on pending motions was delayed until September 18. Assistant District Attorney Lewis Jones appeared for the state. Sumlin’s health appears to have declined in the three years since his arrest, and he limped noticeably as he left court. He has been free on bond since his arrest. The Executive Committee of the Sparta Groundwater Commission will meet today (Thursday, May 10), 2:00 PM, Ruston City Hall Peach Suite, 410 North Trenton Street. The Lincoln Parish Court House is about to get some security upgrades, after a vote to approve some of the recommendations heard in the Lincoln Parish Police Jury’s Public Property and Buildings Committee meeting. Among the more significant improvements proposed are new entryway doors at the north ground floor and south first floor, a metal detector and package x-ray device for the south entryway, and a handicap access ramp for the south entryway. When completed, the only access for the public will be through the south door that faces West Texas Avenue. The metal detector and x-ray will be placed at that location, and manned with two security guards whenever the court house is open. Court house employees will be able to enter through the other entryways via an electronically activated lock. Estimated cost of the improvements is about $128 thousand. Jury Purchasing Agent Jeri Webb and Homeland Security Director Kip Franklin made the presentation. Franklin noted that the courthouses in other area parishes had secure entryways in place, including Jackson, Bienville, and Ouachita. Not approved was the hiring of the security guards. Jurors balked at the $32/hour rate for each of two Lincoln Parish Sheriff’s Office deputies. The estimated yearly cost for the deputies is about $94 thousand. See here the complete presentation. Another court house issue addressed was repairs to the elevator. The device is vintage 1950, and has many outdated parts, which must be replaced. The cost of that item was estimated at about $150 thousand. In the full jury meeting, the opioid litigation was again on the agenda. Like last months meeting, there was considerable discussion. Some jurors suggested the possibility of hearing more pitches from interested attorneys before making a final decision, but most were inclined otherwise. On a motion by Pullen – seconded by Annette Straughter – to decline participation in any lawsuit, the jury agreed 10-1. Voting no was Nancy Wilson. Jody Backus was absent. In other business, there was a bit of commentary during the budget presentation regarding jury funding for sheriff’s deputy transportation of prisoners. That particular line item is budgeted for $30 thousand for the year. We were notified today that the pay rate for deputies should have been listed @ $22.50/hr, rather than the original $32/hr. The estimated yearly cost of $94 thousand is accurate. Improved cell phone and wireless data connectivity could be available in the Ruston area within the next year or so, if the Ruston City Council next month approves an ordinance introduced at last night’s meeting. 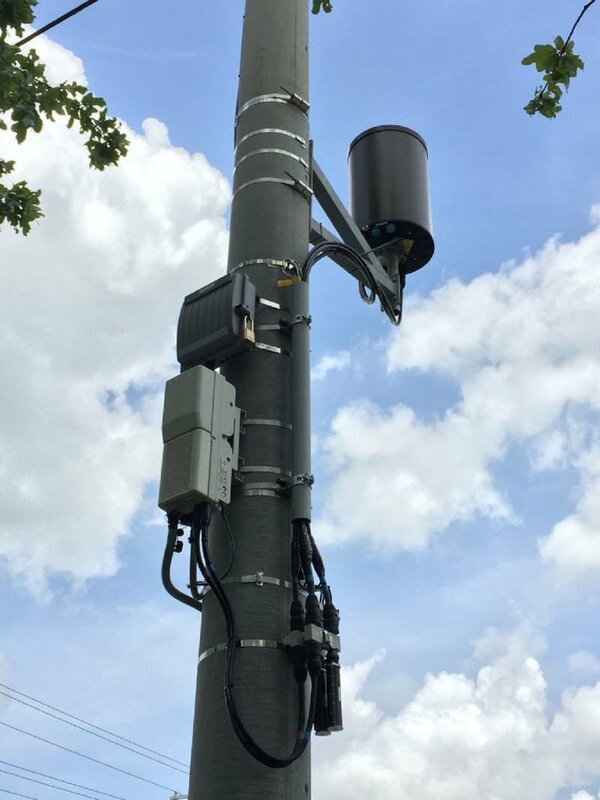 The new ordinance would allow the city to lease space on utility poles for “small cells,” enabling 5g (fifth generation) cell and mobile data coverage. These cells will augment the network of existing cell phone towers, and fill in areas that now may have marginal coverage. They would form a dense network to relay signals to one another, much like the existing cell tower system does, but with more complete coverage. Additionally, a 5g network will allow greatly increased mobile data speeds, up to 1 gigabit/second, it is claimed. The ordinance sets uniform standards for placement of the units, so as to prevent obstruction to existing facilities, and assure preservation of the areas where the units are installed. A representative of AT&T was at the meeting, telling Lincoln Parish News Online that should the ordinance be approved, work could begin on the system within a matter of months. The regular monthly meeting of the Lincoln Parish Police Jury will be Tuesday, May 8, Lincoln Parish Court House, third floor. Here are the committee agendas and meeting times. You are currently browsing the Lincoln Parish News Online blog archives for May, 2018.